The Dion Neutra/Reunion House is the only example of a firm designed project on which both father and son worked, but not concurrently. The house was envisioned in 1950, as a hypothetical “grandparent’s house” where family reunions would be held. The senior Neutras lived in it for two years starting in 1964. From 1966 on, it has been the home of Dion Neutra. In 1968, he added an apartment above the garage; 2440A. It is the most private of all the homes in the Neutra Colony; in addition to a selected glimpse of the lake, it is hidden in a forest of trees and ponds, creating an amazing tranquil setting, while masking the undesirable aspects which used to be seen on the street. It was decided to pick some dates, to allow the public to experience another Neutra Interior. 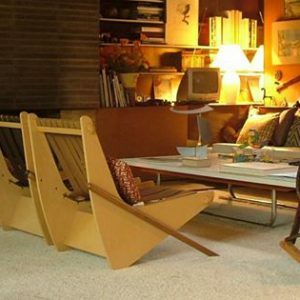 Opportunities to purchase select Neutra Books is also contemplated on these occasions. Note: For special occasions, it is sometime possible to schedule a custom tour at another date. We have a minimum for such, at $400 for up to 20 persons. $20 each for any extras. Contact Dion at Dion@Neutra.org for details. 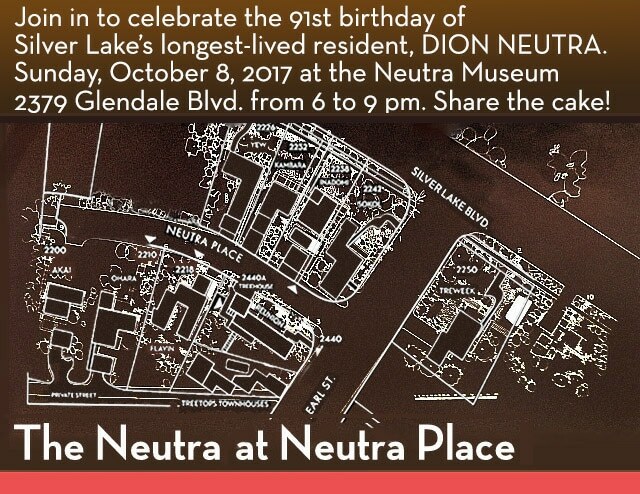 Join in to celebrate the 91st birthday of Silver Lake’s longest-lived resident, Dion Neutra. Come and share the cake! How long has Rotary International been around? The Neutra Practice celebrates 91 years of service to the world community this October, 2017. Like Rotary, we’ve always seen ourselves as instruments of service. Founded in 1926 by my father Richard Neutra, I’ve presided over things since 1970, when he passed from us at the peak of his carrier at 78. I’ve been in position now for nearly 50 years; longer now than he was, during his life. In the late 40s the Housing Authority of Los Angeles announced a Federally funded new program for the construction of 10,000 units of public housing. Armed with the experience he’d garnered with work on public housing in Texas and San Pedro, Dad was in a position to be selected for the major plum of that program; Elysian Park Heights; a 3300-unit project to be sited in Elysian Park. Because of the politics it became clear that he’d have to join forces with someone of like experience to be successful. He made a deal with architect Robert Alexander, who’d designed Baldwin Hills Village. Together they presented and prevailed. As the 40s wound down, they set up shop in the garage of the VDL addition facing Edgewater Terrace. In that space were brought people like Si Eisner, planner, and a few personnel to begin the site analysis and preliminary planning. As that progressed, it became apparent that it would be ideal if a larger space could be obtained in which to collect more people and expertise to execute this very large and complex project. Dad undertook to find a site and design a building. A spot a few blocks away was found and the design of what would first be called the ‘Planning Professions Building’ ; later the Neutra Office Building proceeded apace. By early 1950 it was ready for construction, which was completed by our favorite contractor, Red Marsh, within the span of just a few months. In short order, we populated this building with staff, now augmented to about 10 to 12 people for Neutra and Alexander, in a rear drafting room, and associated engineers in the front part of the building. My first wife and I occupied the upstairs apartment during this first 18 months. Our first-born son Greg spent the first six months of his life there. Because of politics the entire public housing program was aborted by the City of LA. just as our project was being made ready to go to bid. The plug was pulled and we lost the whole thing. In subsequent years the site was taken over to build Dodger Stadium; a blatant misuse of land that had been obtained by Eminent Domaine for a public purpose! Having tooled up for greatness, the partnership shopped for other joint work. Early on, we did city planning studies for Sacramento, Tulsa, the island of Guam. Later design of the US Embassy in Pakistan, Visitor Centers for the National Park Service, and design for buildings on several University campuses, along with Palos Verdes High School. Also several other elementary schools. In the end, design of the LA County Hall of Records in downtown. All this happened as the 50s wound down, and the building had become known as the Neutra Office Building. As the partnership came apart in the early 60s, the building was used by an outfit called ‘Lakeside Architects’. In early 1963, because of a fire at VDL, the Neutra practice was moved overnight to this optional site, and worked there in the front part of the building until the end of the century. In 2000, the project was selected as City monument #640. It was elected to the National Register for Historic Places in 2003. Many of the later iconic designs associated with the Neutra practice were created in this space over the course of several decades. I had moved the practice up to my home office studio on Neutra place by the first years of 2000, and began to rent out the front part of the Neutra Office Building and the two rear apartments as such, having inherited the building upon my mother’s death in 1990. Series of some 30 slides, depicting development of the building over its first half century, culminating in how it looks today as NEUTRA INSTITUTE MUSEUM OF SILVER LAKE both from interior and exterior. To wind it up, some flyers for current shows and books which have appeared in the past couple of years. This is my baby. I led the drawing crew, supervised construction and attended the opening with dad with all the city officials in attendance. I’ve long decried the desecrations that the Rec and Parks Department visited on its ward. How could all this happen to a City Monument? Rather than sweat a tortuous fund raiser from private sources, I think the City’s feet should be held to the fire to where funds are extracted from some coffer and it pays for its own transgressions! I would serve at a reduced rate to oversee these restorations! I would ask the Parks Department to agree to operate within the building as we envisioned it for a year, and then report any perceived tweaks they felt, at that point, were needed to suit their current needs. The VDL Research House II and the original version of Painted Desert Visitors Center, AZ have been chosen with 20 other historic sites by outgoing Secretary of Interior to NATIONAL HISTORIC LANDMARKS! This is the highest level of appreciation for important Historic Sites and is a great honor for us here at the Institute! Ironically, it was to this same honor that our Gettysburg Cyclorama Visiitors Center (same vintage as Painted Desert; 1960s) was nominated to, about 15 years ago with 20 other candidates. It was the only one NOT chosen at that time to be so honored! Instead, some years later, the National Park Service presided over its destruction and grinding to powder on its site in 2013! Check out Dion’s ebook available here about the Cyclorama’s destruction. 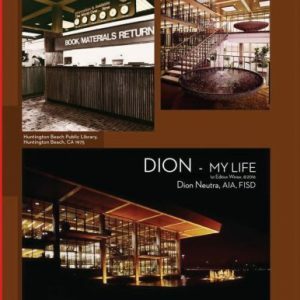 Dion Neutra has published the first edition of his autobiography: “Dion – My Life”. A perfect Christmas gift for the Architecture lover in your life. Writing one’s autobiography would seem like a good time to try and summarize what one’s life philosophy has been like. Looking back, it would seem for one thing, that I’ve lived somewhat reactively, in that my career was suggested by others (my dad), and I followed that lead, however much I’ve enjoyed the profession since. I think I’ve basically always assumed things were ‘possible’, and set out to actuate them once the course was set. In many cases, I created something out of nothing, and introduced concepts that the client might not have thought of as part of the basic program. I admit emulating this from dad, who was fabulously talented in doing this, on almost every project. I like to think that I was basically an optimist and approached the challenge with the best intentions and hopes. That I often was blocked or frustrated was more about the “NIMBYs” in my life than a flaw in the proposed course of action. Pretty much throughout my life, I’ve lived with a sense of urgency. The feeling that there was much to be accomplished, and perhaps not enough time to do it. For this reason, I’ve been active 16 to 18 hours per day, always seeming to have an agenda yet to be addressed. I do think I had much more potential to do significant works. Regret not having the chance to find out. This was especially true after my dad’s passing. Kept trying by putting it out there in the late 80s and since, that the practice was still vital and available for work. We became alarmed at the changes made in the lobby of the building. We ask that the historic desk and Museum graphics be reinstated, along with the displays of Neutra projects and books for sale, that used to line the shelves. Please sign the petition below to pledge your support. Thank you for your continued tax deductible support of the Neutra Institute for Survival Through Design, and its new Neutra Institute Museum of Silver Lake. Proceeds will continue to go towards causes of preservation, with special emphasis continuing on into next year towards the events to be scheduled for Earth Day week, ending Sunday, April 23, 2017 and ‘Preserving VDL’. This iconic monument will continue to be in need of repairs of all kinds, and desirably an endowment! To learn how you can become involved we have all the information on our Volunteer Opportunities page. If you know of a Neutra building, or if you OWN a Neutra building, please get in touch with the Institute and give us the latest information about the building and its current owner. The Institute is assembling a database of all current Neutra building owners. Our goal is to create a mailing list for news about the preservation and conservation of what remains of the Neutra oeuvre. If you have any information, please send it to Dion Neutra. Please include phone numbers, fax numbers, and e-mail addresses if available.